Scaling new heights, industry pioneers, The House Of GBTL-Grasim & OCM announces the launch of a New Age Brand ‘GRADO’. 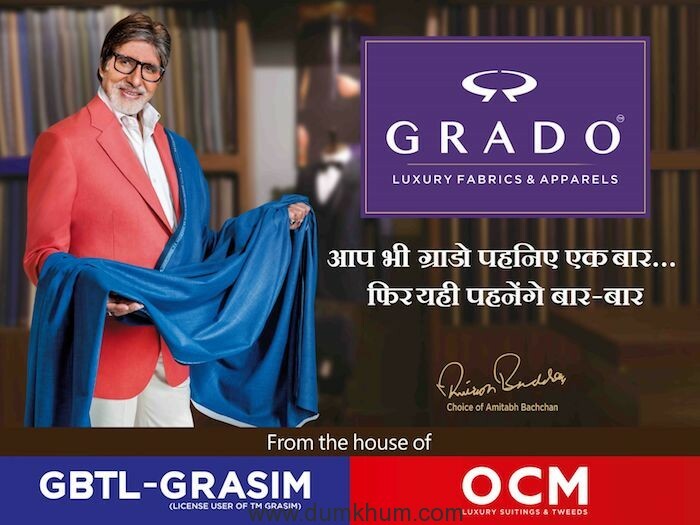 With the advent of ‘GRADO’ and the combined star wattage of the greatest actor of Indian cinema, Mr. Amitabh Bachchan as the Brand Ambassador, Brand ‘GRADO’ is all set to usher a successful new wave in the Luxury Fabrics & Apparels industry. Mr. Rahul Agarwal, Director, GBTL said “GRADO is a premium brand. It has been observed in the Indian market that youngsters dress in blazers co-ordinating the same with a denim or a chino. Keeping this latest trend in mind GRADO has come up with an exclusive segment of Blazer fabrics for all occasions. GRADO Luxury Fabrics along with exclusivity, in design offers great finish and superb lustre.